A Florida couple accused of strangling a 19-year-old girl are almost certainly going to be convicted after leaving what amounts to the longest and most comprehensive trail of incriminating digital evidence we've ever seen. Sheesh, has nobody heard of incognito mode? 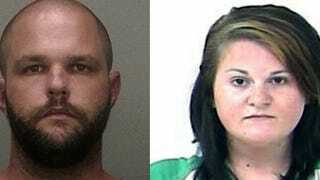 James Ayers, 32, and Nicole Okzersik, 23, just gave the world a lesson on how not to commit a crime and get away with it. And it's a good thing, because that means they'll serve hard time. Ayers is accused of strangling Juliana Mensch on March 24th for drug money. Okzersik will appear before a grand jury this week, which will determine if she should be charged in connection with the murder. Here's a rundown of boneheaded digital mistakes the couple made leading up to the murder, as reported by the Daily News. Okrzesik did an Internet search for "chemicals to passout a person," "making people faint," "ways to kill people in their sleep," "how to suffocate someone" and "how to poison someone"
That's pretty incriminating, but not as incriminating as their long string of bickering text messages in which the couple tried to determine what to do with the dead body they had on their hands. Ayers texted Okrzesik to tell her he was calling the cops if she did not come home to help him with the body, according to the records. "Why the f- would you do that and ruin both our lives when we can just get rid of the sh- and move on," Okrzesik responded. Ayers continued to threaten his girlfriend several hours later. "We have a dead body in the house and you want to play?" he allegedly said. Busted. Obviously, the couple discussed the crime on Facebook, but what's even worse, is that they posted pictures of themselves partying at a bar together just hours after the murder. Really, guys? NO SHAME.